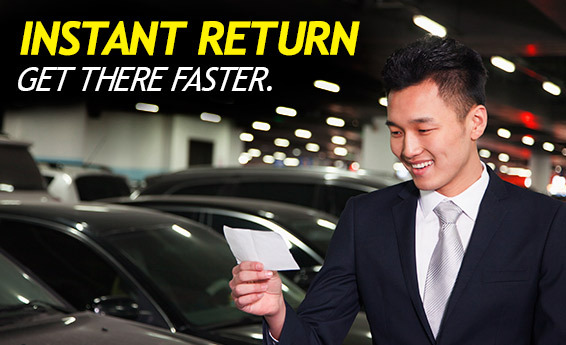 Hertz Instant Return allows you to drop off your car and get on your way to your next adventure. A Hertz agent equipped with a tablet will greet you at the rental car to inspect your vehicle, determine whether any additional charges or reductions apply, and close out your rental. Once the quick review is complete, the agent will compute a receipt for you in less than a minute! All rental charges will be applied to the credit card presented at time of rental. You can also input your frequent traveler number at time of return. As a Hertz Gold Plus Rewards® Member, you can also sign up for eReceipts and Express Return® Services to experience super fast car rental drop off. Update the Vehicle Preferences page of your Hertz Gold Plus Rewards Profile and we’ll send you a PDF copy of your eReceipt as soon as your rental agreement is closed. On return, just fill in the Express Return slip on your Rental Agreement, leave it with the keys on the dashboard and get on your way. For more about eReceipts and to update your Hertz Gold Plus Rewards® profile, please click here.